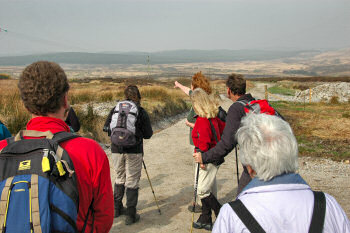 DJ set the challenge, today Lindy MacLellan and Bryony MacFarlane rose to it with another great walk on Islay. 40 walkers met at Bunnahabhain this morning for a walk through the wilderness of the north-east of Islay to the summit of Giur-Bheinn. Similar to yesterday it was quite hazy again, so we could only just see our destination for the day when Lindy pointed it out. This walk allowed dogs to be brought as well, so we not only had the 40 walkers but also six dogs joining in. Initially kept on a lead they were soon given a free run. A lot of running backwards and forwards for them while us walkers made our way along the Ballulive track and then through the forest to Staoisha Eararaich. 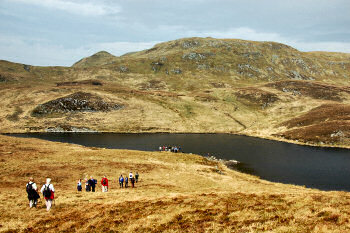 After approx two hours we reached Loch Giur-Bheinn, where both humans and animals had their lunch. 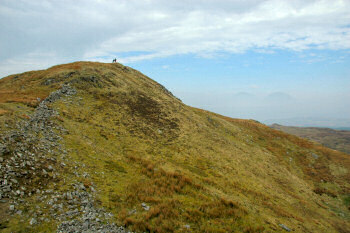 Then it was time for the final push to our goal for the day, the steep ascent to the summit of Giur-Bheinn (318m). Soon we were at the cairn (several stones and rocks were brought up from further down as well), enjoying some of the views. As it was still quite hazy the views weren't as good as on a clear day, the haze created some interesting views though: Almost like in an inversion most of the haze seemed to be lower down, allowing us to make out the tops of the Paps of Jura, but not the middle section. Looks closely at the picture and you should be able to see it. Finally a bonus picture (I had only planned to post three pictures per walk here). While there wasn't as much wildlife as yesterday we did see some deer. And at least two adders. This time I managed to take a picture of one of the adders, as it was quickly disappearing into the grass hissing angrily. 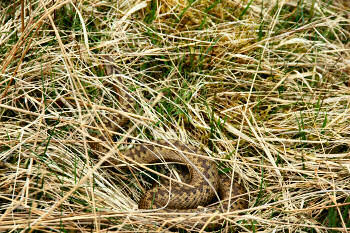 Adders (and ticks, but that's another story) are something you need to watch out for when going into the hills on Islay. They are not aggressive and only attack when harassed or threatened, but you should try to avoid stepping on one accidentally (their venom poses little danger, but a bite is painful and requires urgent medical attention). That was our walk today, a very nice walk with a lot of nice people (and dogs). Now I'm off to the Port Charlotte Hotel for some live traditional music. It's supposed to start at 21:00 (i.e. now), but I hear the usually start late. And it's not too far from here anyway. Hopefully you'll be able to read more tomorrow.